Is it possible to write a story in six words? That’s one of the questions I asked Durham’s Cuckoo Young Writers group when we looked at flash fiction in June and July. 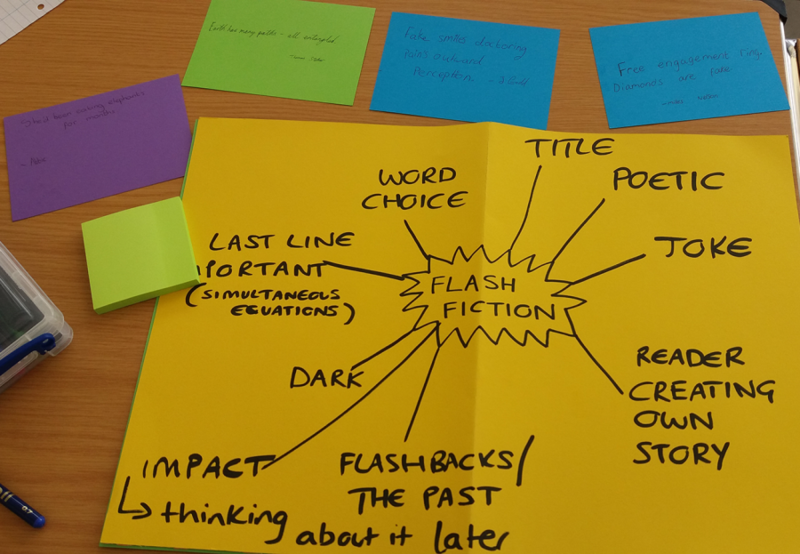 Flash fiction is the most common name given to extremely short – but complete – stories. Exactly how short is debatable, but stories are typically no more than 1000 words. Whatever the case, it’s a popular genre which offers many opportunities for publication, particularly for young writers. I began by asking the group to consider the rules of short story writing. Were there any? What elements should a story include? Could this translate to shorter pieces? Did they still need a beginning, middle and end? A protagonist with a problem? To help, we read and discussed a lot of flash fiction. Some used a traditional structure. One began at the end and ended at the start. Some felt more like a poem. Or a joke. Others were sad. One was written as a conversation. Another as game instructions. There was one that none of us understood. It seemed anything was possible. Free engagement ring. Diamonds are fake. She’d been eating elephants for months. Earth has many paths – all entangled. Fake smiles doctoring pain’s outward perception. Decide what your story is about. A moment? A premise? A message? Summing up the theme of your story in a sentence or word can help you decide what you should and shouldn’t include. Be prepared to revise dramatically. Cut anything that isn’t necessary or doesn’t serve your theme. Adverbs. Introductory paragraphs. Characters. But be precise. Spend time to find the perfect word; one that conveys exactly what you want it to or that could replace a sentence of description or explanation. What isn’t on the page is as important as what is. Involve your reader in the story. Get them to fill in the gaps with their own assumptions and interpretations. Is the protagonist’s wife dead or stuck in traffic? What’s implied by the bus driver’s bitten fingernails? Compare the time it takes to read a novel to a 50 word story. Flash fiction only has a moment to make an impact. Help your writing linger in the mind of your reader by using striking images and details. Show them something new or something familiar in a new way. Make them think. Take a prompt and run with it. Test an idea – it doesn’t matter how weird it is. Experiment with different ways of telling the same story. You have nothing to lose. Go for it. Fantastic advice from a group of talented writers. I learnt a lot during our sessions and left feeling inspired. Thanks everyone: keep on writing (and submitting) your brilliant flash fiction.